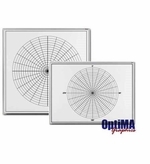 OptiMA dry erase boards with grids, graphs and lines are great for the classroom, office or the production floor. 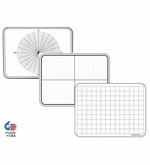 Use our large dry erase grid boards for scheduling or teach students to plot coordinates on an XY Cartesian grid board. 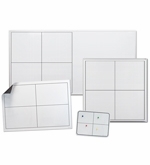 Our grid boards allow you to add your own columns to customize the board to suit your individual needs. 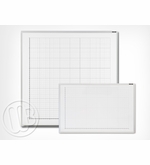 We use own exclusive OptiPrint™ dry erase method for all our grid graphics. You'll be getting one of the best dry erase writing surfaces available today so the board will look and function great. When you buy an OptiMA printed board it we promise that there won't be any ghost left behind when you erase. 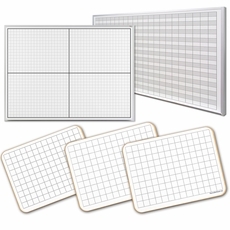 With proper care and maintenance you'll be using your dry erase grid board or lined boards for years. The lines and graphics are under the dry erase material so they will never scratch or fade. We make a variety of graphic boards in either magnetic or non-magnetic options in a variety of sizes and styles. 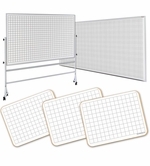 OptiMA has a great selection of dry erase grid boards available as small as a handheld student lap board and as large as a 4' x 8' wall mounted board. 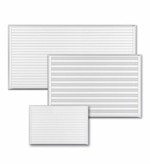 We offer four different grid patterns that range from a 1" x 1" to a larger 2" x 3". 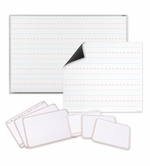 Our horizontal lined dry erase boards come with lines spaced either 1" or 2" apart. You can get grid or lined boards with variegated shading to make them much easier to use. Why use a board that doesn't fit your needs. Every one of our stock graphics can be customized to suit your individual needs. We can create custom grid sizes, add special headings, create specific column widths and add full color to any design. Contact our customer service staff for help.